How to Choose a Proper Flap Disc? 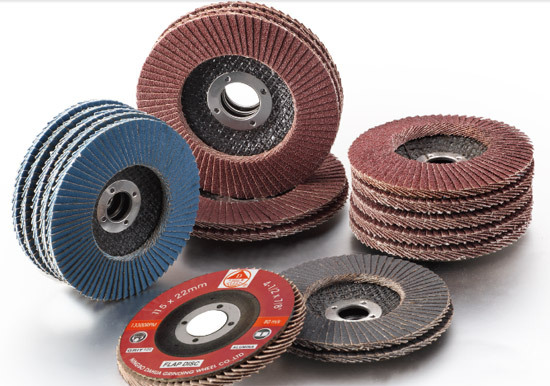 Flap discs are used for blending, grinding and finishing for an item. It is special for its low vibration in use, which means the operator experiences less fatigue. Flap discs can be made of a variety of abrasive grits, different abrasive densities, disc shapes and backing plate materials, etc., then how to choose a proper flap disc for some different uses? A major aspect of the flap disc is the grit size. For metal work applications there is a choice of three types, including aluminum oxide, zirconia alumina and ceramic alumina. The abrasive density is one of the factors affecting the sanding results, it is better to choose the proper abrasive density for different uses. The flap disc has flat or conical shapes that able to work flat or at an angle. The flat shape is favored for finishing and used mostly on flat surfaces, while the conical is more practical for extensive stock removal. The backing plate can support the disc for a stable and smooth cutting and sanding, those aluminum, plastic and fiberglass are the most popular materials. Take the fiberglass material as an example, it is a practical choice for those operators that want to cut down on vibration while in use and seen as the best option for most applications because of its light weight and high strength. What Are the Applications of Fiberglass Nets? How to Correctly Apply the Diamond Cup Wheels? Are the Coated Abrasives Materials the Harder the Better? What’s the Basic Information of the Wire Brush? Is the Number of Fiber Disc Blade the More the Better? How to Check the Cutting and Grinding Wheels? How Many Types of Mounted Points? Which Grinder Can Be Used for Grinding Woods?